Pittsburgh has a respectable food truck scene. It’s great to have a variety of foods from different cultures or different culinary genres to try. I love how the food trucks make a really good effort to make their food available to the whole Pittsburgh region. I really enjoy attending food truck round ups, especially when beer is available. We now take food trucks for granted in Pittsburgh, but it was really only just a few years ago when there were barely any in this city. This could be blamed and still blamed today on stupid ordinances making it difficult for food trucks and food carts to operate in Downtown Pittsburgh. When they started to finally pop up around the city, I feel everyone knew about BRGB and Nakama since they had physical restaurants and PGH Taco Truck and Southside BBQ because they were at every event. What is crazy about this city is we needed to go to food truck round ups to get our food fix. Coffee shops like Coffee Buddha and breweries like Brew Gentlemen located outside the city limits held monthly and very successful events to bring the food trucks together. These events allowed me to learn about and love so many of the trucks and other food vendors this city have and should embrace. The early food truck round ups allowed me to fall in love with a couple specific trucks or carts. I became a frequent visitor of the Southside BBQ food truck at both of those round ups. Some other time, I’ll talk about how BBQ is also taking Pittsburgh by storm. 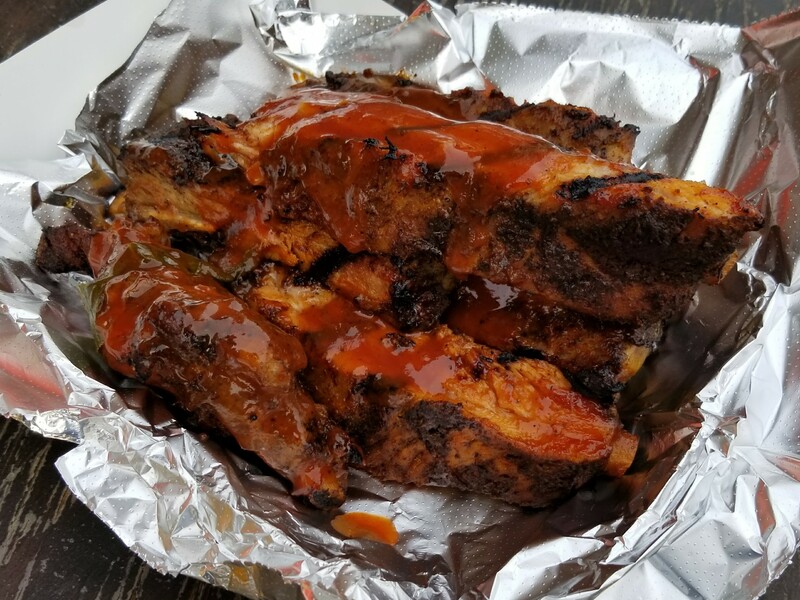 Southside BBQ was not only an early entry into the food truck game in Pittsburgh but run by what was formerly 17th Street Cafe. I fully supported their decision to convert the long time restaurant into a brick and mortar version of the successful food truck, but enough about history, let’s talk about food. 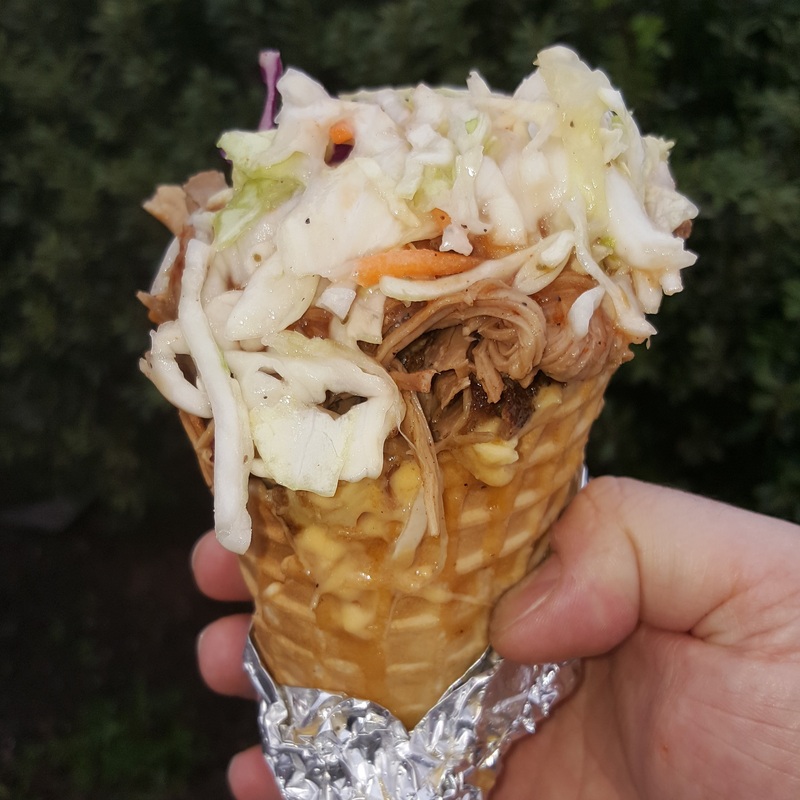 They are probably most well known for the Bar-ba-cone, which is a waffle cone filled with mac and cheese, pulled pork and topped with cole slaw. It’s a pretty awesome combination. Top it with one of their sauces for a little extra kick. However, my favorite is their ribs. I like to call them my dessert ribs. I usually like to have them for dessert at food truck round ups since main times trucks don’t have dessert. Ice cream and cake is great, but who doesn’t like a second helping of meat. Their pork ribs are always heavy on the meat and easily pull off the bone. So this isn’t exactly a food truck but more of a table and a cooler, but a fantastic product. 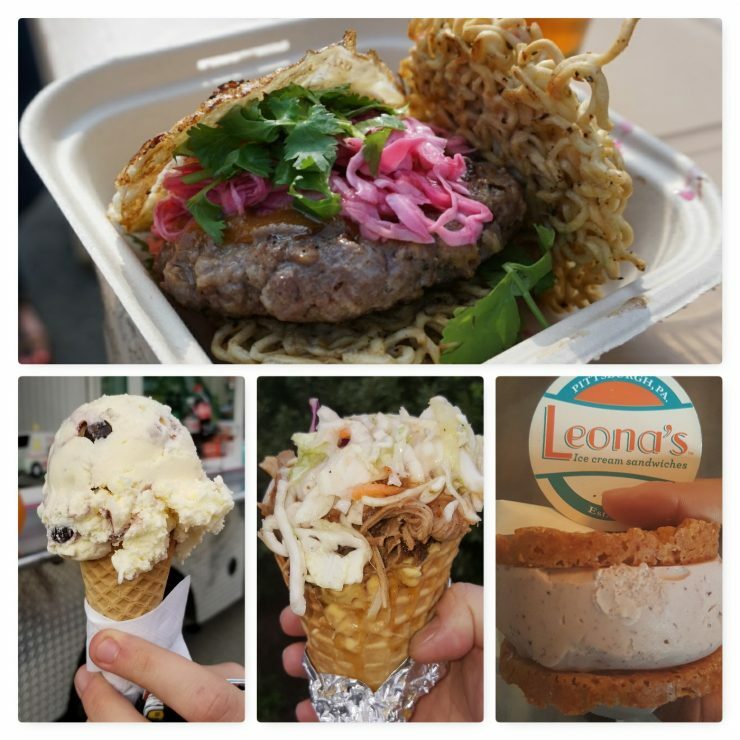 I just discovered Leona’s at the food truck round ups and feel they should be included in this list. Leona’s makes rather large ice cream sandwiches. 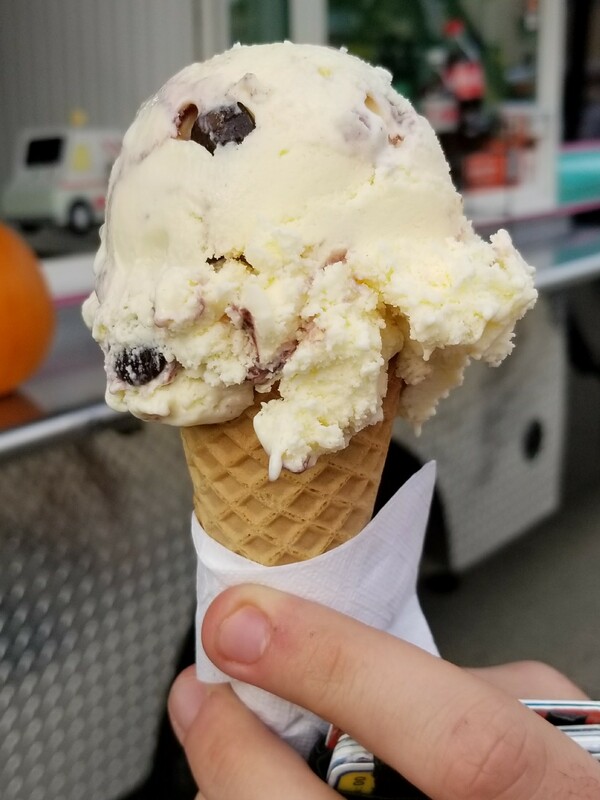 The ice cream and cookies are made by in small batches. They use local ingredients as much as possible. The best part to me is the ice cream is made 100% lactose free. The ice cream flavors are incredible. I usually will pick something that is seasonal. 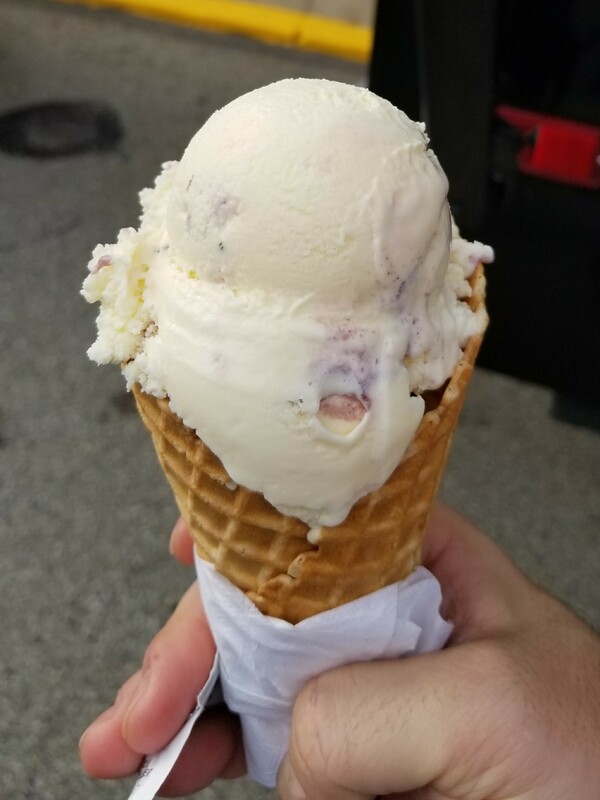 I have had sandwiches with cherry ice cream, plum ice cream, and double chocolate ice cream with cookies like chocolate chip, sugar, ginger snap and double chocolate. 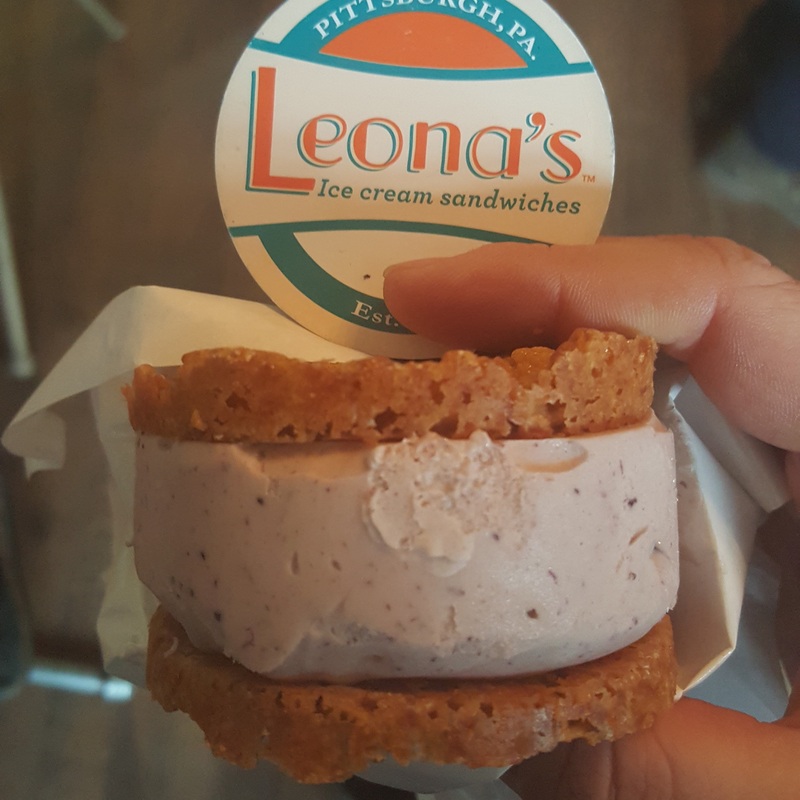 Now, Leona’s is also sold in some local Pittsburgh stores and restaurants and worth getting as a dessert. Over time, some locations for the round ups had to change. 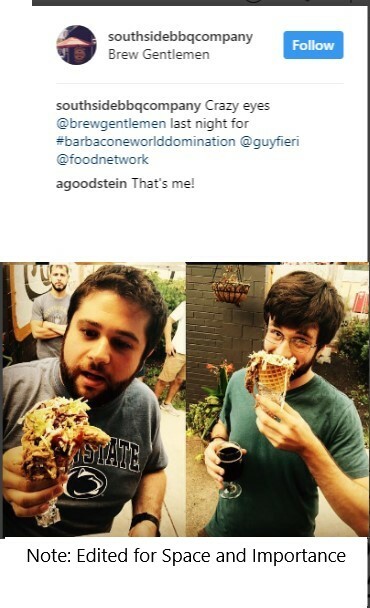 It was a disappointing time when Brew Gentlemen announced they were going to stop hosting the events. New locations like Voodoo Brewery and Bakery Square and events like Squirrel Hill Night Market. At these new events I have discovered some of the newer batch of trucks with unbelievable flavors. I only finally got to try Blue Sparrow this summer, but wow. I started out with the ramen burger. 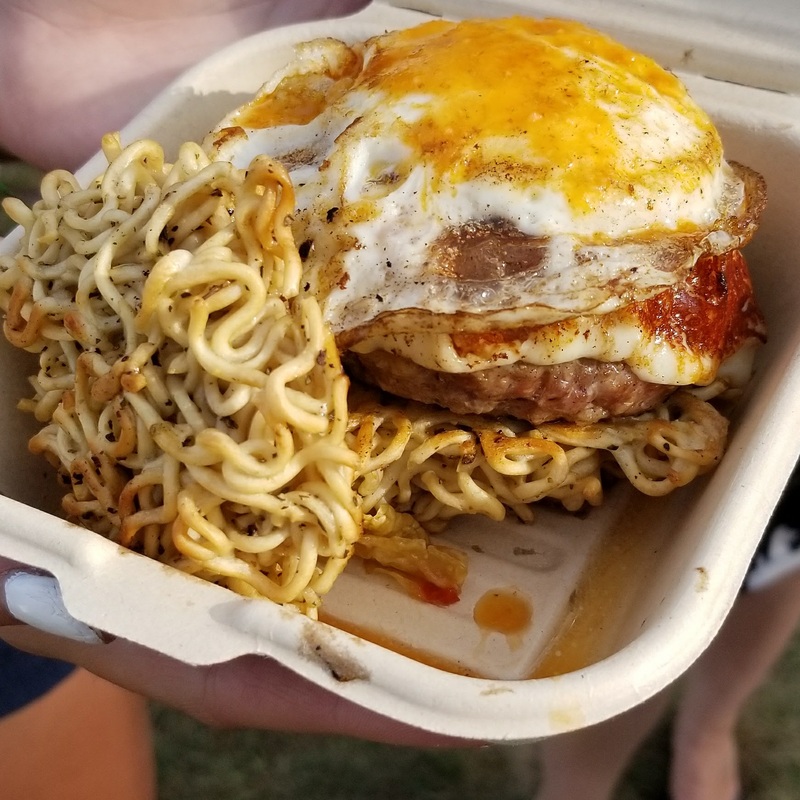 This was a burger made with beef from local farms and a bun made out of ramen noodles. 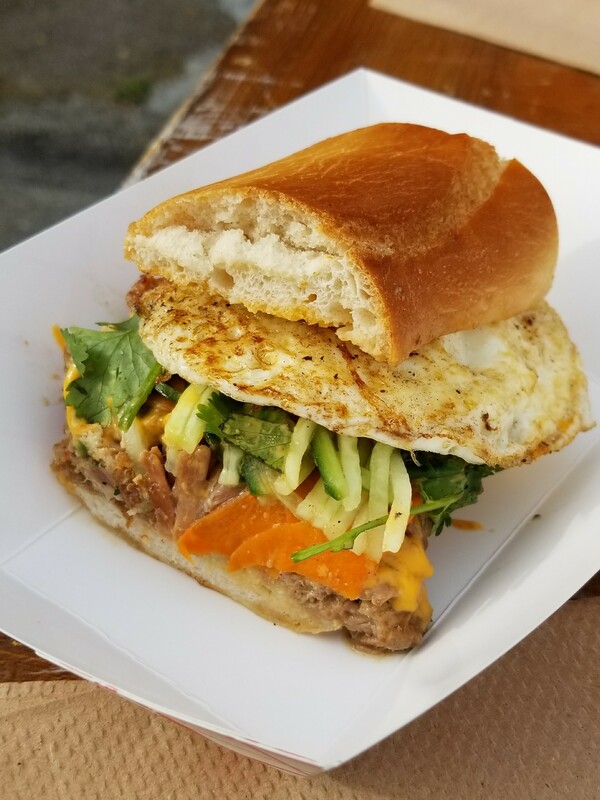 This one was topped with peanut ginger sauce, pickled cabbage, cilantro and a fried egg (Remember: a fried egg improves every sandwich). This was one of the juiciest and most flavorful burgers I have ever eaten. 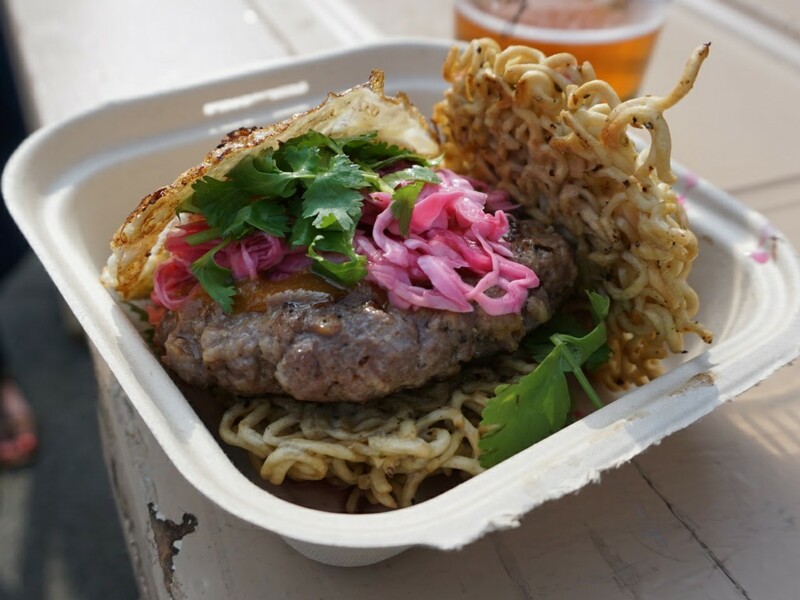 The ramen bun is not what you expect either as it was soft but stable. My second time ordering I got the ramen burger with fried mozzerella and an egg. Again delicious. They have a way of getting the flavors to merge together well. Now that I have eaten the burger twice, I had to try the bahn mi sandwich. I shared one with my brother. 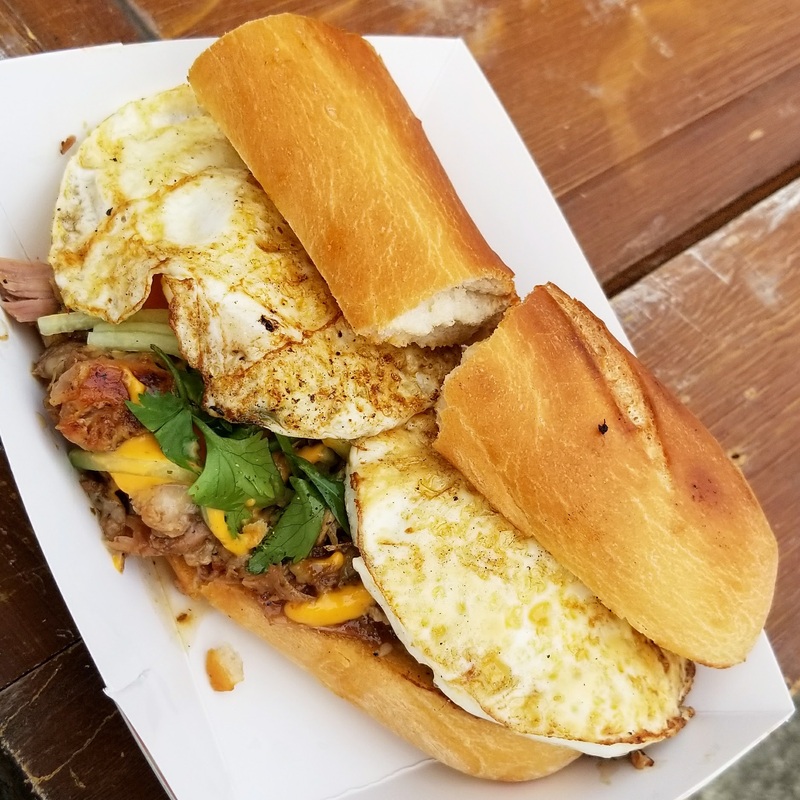 We got it with pulled pork, sparrow sauce and fried eggs on top. This seriously might be one of the best sandwiches I’ve eaten (even if I do say that probably every few months as I discover something new). Blue Sparrow has quickly become one of my top food truck choices in the area. Ice cream trucks are like the original food truck. As a child, there were two in my neighborhood in New York, a Mr. Softee and a super shady truck that sold ice cream and random other foods. Sugar and Spice isn’t like those ice cream trucks serving novelties. 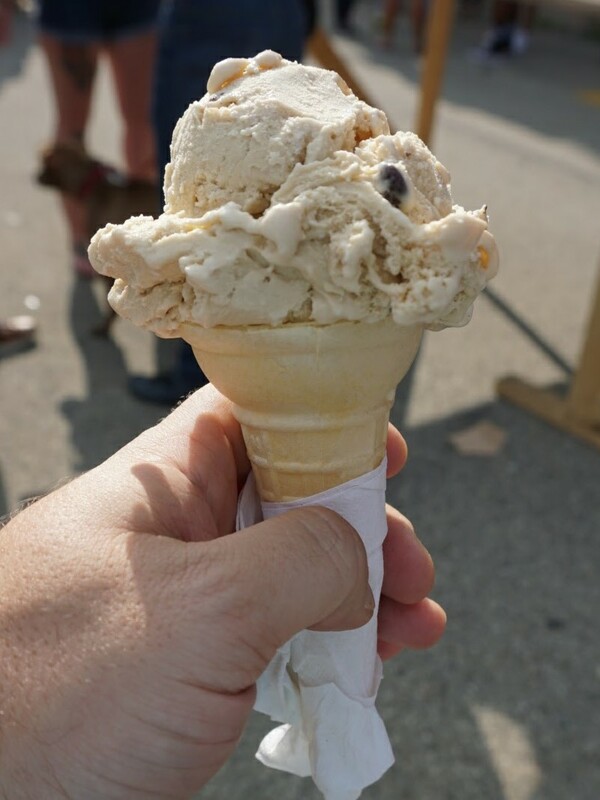 They dish out cups, cones, sundaes and milkshakes using homemade ice cream from their brick and mortar location. It’s not to sweet and not too creamy. The price is very reasonable for homemade ice cream as well. So far I have enjoyed the cookie dough, cookies n cream and black raspberry chocolate. One of the most exciting things for me recently was realizing their ice cream with chocolates mixed in us es Gertrude Hawk Chocolates, which is a staple of Eastern Pennsylvania and my chocolate of choice. The people of Pittsburgh is doing a great job welcoming food trucks to the region. The issue is Pittsburgh is still not a food truck city. On my recent trips to San Francisco, there were multiple streets and parking lots lined with food trucks. There were so many different options and it wasn’t like they were preventing people from choosing to order at a brick and mortar restaurant. Downtown Pittsburgh does not have food trucks with this kind of regularity and it needs to happen already. The round ups and events help, but it’s really not enough opportunity to enjoy these quick great meals. I need suggestions. What food trucks do you all like?